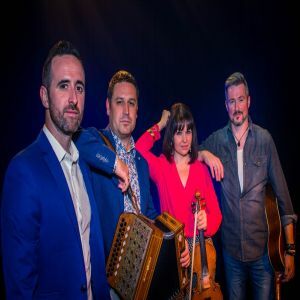 BackWest are a group of four young musicians, filled to the brim with the music and soul of the west of Ireland, three members reared in the heart of Galway city alongside a fourth member from Headford in Co. Galway. Their stage show is a winning combination of traditional, sassy, modern, technically perfect and musically inspiring, delivered with tremendous and rampant energy. Described by “Roots magazine as “The icing on the cake” with “razor sharp precision” and “state of the art performance” the highly regarded musical siblings, Maureen and Brendan Browne, on fiddle/vocals and accordion respectively, join Lord of the Dance Peter Vickers on hand and foot percussion accompanied by virtuoso guitar/vocalist Fabian Joyce. Individually they hold authenticity; collectively they showcase the powerful ensemble of Western styles. They have performed at International Festivals, danced on the biggest stages including ‘Lord of the Dance’ and they have featured on TV stations and radio programs across the world.